AC inverters are like other technology in that during the early years they were very expensive and didn’t work particularly well. Over time they were tweaked and improved and today inverters are better and less expensive than their ancestors. I suggest including an inverter in your off grid plans even if you don’t think you need one because the day may come when it will be an essential asset. Furthermore, if you have any intentions of owning a larger solar energy system to power common household devices, then a familiarity with AC inverters is a must. The technical details of AC inverters has been covered before here on Off Grid Ham. (links are at the end of this article). This time we will go over the different types of AC inverters, why they are different, and why it matters to your off grid goals. There are three basic types of AC inverters on the market: Square wave, modified sine wave, and pure sine wave. Which one will work for you depends on what you plan on powering and of course your budget. From the closeout bin: Square wave. Square wave AC inverters do not produce true AC power, but rather, pulsating DC. The format is so outdated that the only square wave inverters I could find for sale were cheap imported knock off brands (which I would never recommend) and the small 100-150 watt versions designed to plug into a 12 volt automotive socket (which have very limited usefulness). For electronics that normally run on DC power, square wave AC inverters are acceptable for intermittent use. This would include laptop computers, TVs & other electronics, and almost all amateur radio gear. In some cases, your power supply may run hot, which in turn means increased likelihood of failure. AC electric motors depend on a true trigonometric 360 degree sine wave cycle to operate properly. Since a square wave is really just pulsating DC, it messes up this important process. AC motors will run on square wave electricity, but you’ll notice they may make a funny sound and will not be as powerful. AC motors will tolerate square wave for short periods but it is not recommended for long term use. Because square wave AC inverters are more or less obsolete, I suggest going for it only if you have no other options. Other than that, there is no compelling reason to use square wave AC inverters. They work ok for their intended applications, but with newer, better options, why bother? Middle of the road: Modified sine wave. When it became apparent that square wave AC inverters were going to have limited usefulness, and true sine wave inverters were still too expensive, engineers came up with the modified sine wave inverter. Modified sine wave AC inverters are still not “real” AC and like their predecessors are really just a form of pulsing DC, except the DC is “stepped” up and down to somewhat imitate an actual sine wave. This resolves some of the issues that square wave had with electric motors while still being affordable. For many years, modified sine wave AC inverters were the best technology on the consumer market. As for what will work and what won’t, there are a lot of variables. Some AC motors will run ok on one modified sine wave inverter and poorly on others. The design of the device and the inverter have a lot to do with it. Laser printers, florescent lights, battery chargers, and variable speed motors (such as a drill or sewing machine) are well known to have problems with MSW power and can even be damaged by MSW inverters. Modified sine wave AC inverters are readily available and many radio amateurs use them with great success. If keeping the budget low is a priority, then this is the inverter for you. It has limitations, but should give acceptable results most of the time. The real thing: True sine wave. Pure, true, and full sine wave inverters (the terms are interchangeable) are at the top of the pyramid and provide the same 60 cycle alternating current that comes from your commercial power company. Depending on where you live, the inverter may produce better, cleaner, more stable electricity than your power company! The cost of these AC inverters has come down a lot. It’s worth your effort to shop around. While researching for this article I discovered that prices are all over the place, sometimes swinging as much as several hundred dollars for the exact same model. In other cases I found pure sine wave AC inverters on sale for less than their modified sine wave equivalent. There are no restrictions on what devices can be powered by pure sine wave AC inverters, assuming you do not exceed the wattage capacity of the system. If something can be plugged into a common 120 volt wall socket, then it can be plugged into a sine wave inverter. They are the best choice for running electric motors or any device that is sensitive to power quality. There are no real disadvantages to pure sine wave inverters other than the cost, which lately has become less of an issue. The inherent design of AC inverters makes them prone to causing interference in your HF radio. The effects will vary depending on the quality of the radio and inverter, how and where your system is grounded, and the physical orientation of the radio in relation to the inverter. You may get lucky on your first try and not have any problems at all. If you experience RFI, it may take some trial and error to sort it out. First, make sure everything is correctly grounded. Nearly all RFI problems are due to grounding issues. If that does not work, you may need to increase the physical separation between the radio and the inverter. If you are getting RFI from a cheap, low end inverter, it’s possible you may never resolve the problem other than to move the inverter way far away from the radio. AC inverters and medical devices. Being able to operate medical devices off grid is a huge concern for many. If you or someone you care about uses a CPAP machine, oxygen generator, peritoneal home dialysis, or needs to keep medication refrigerated, losing power could create a life threatening medical crisis. There is such a thing as “medical grade inverters” but I could not figure out how they are different than other AC inverters. ISO Standard 13485 addresses medical equipment in general (not specifically inverters) and seems to deal with process and product management, not the technical characteristics of the equipment itself. When powering medical equipment off grid, do not experiment or throw something together from whatever Bubba sold you at a ham fest. Consult product tech support and/or the vendor and follow their advice. If you decide to wing it on your own, at the very least use a pure sine wave inverter from an established, respected brand. Never, ever power critical medical equipment from square or modified sine wave AC inverters without the manufacturer’s explicit approval. This article is not meant to be a buyer’s guide to specific brands but I will say that I personally use only pure sine wave AC inverters from Samlex and ExcelTech. ExcelTech’s prices will take your breath away but it truly is the “Rolls Royce” of inverters. In a world where it’s just assumed that electronics are purposely designed to have a short life cycle, ExcelTech is a standout. They cost double or more than lesser brands but if operated within specifications you will never need to replace an ExcelTech inverter. It will likely still be chugging away long after you’ve left this world. ExcelTech really is that good. Samlex is not on the level of quality of ExcelTech but it is still among the best out there. It has a very high “bang for the buck” payload and they are competitively priced. If you can’t afford a “Rolls Royce” but need something that won’t let you down, Samlex is the answer. There are three types of AC inverters: Square wave, modified sine wave, and pure sine wave. Square wave is not real AC; it is pulsating DC. Modified sine wave is still pulsating DC, but the voltage is stepped to imitate actual AC. Pure/true/full sine wave inverters produce accurate 60 Hz alternating current just like commercial power companies. 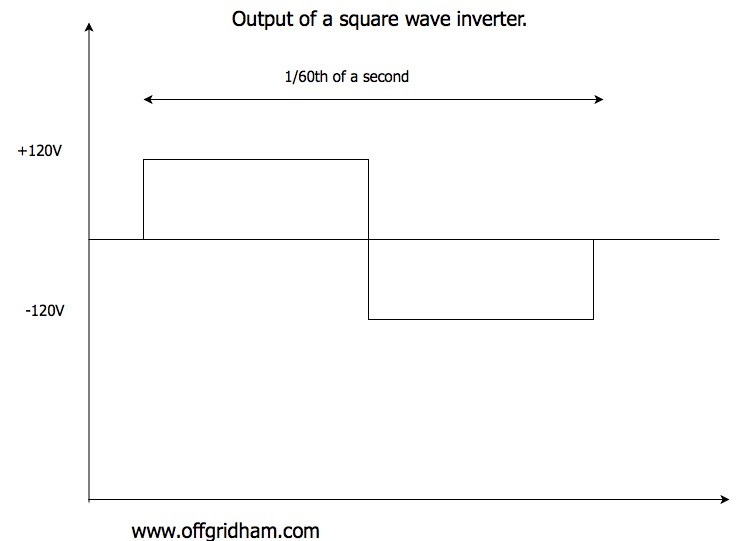 Square wave is the least expensive, but it is outdated technology and should be avoided. 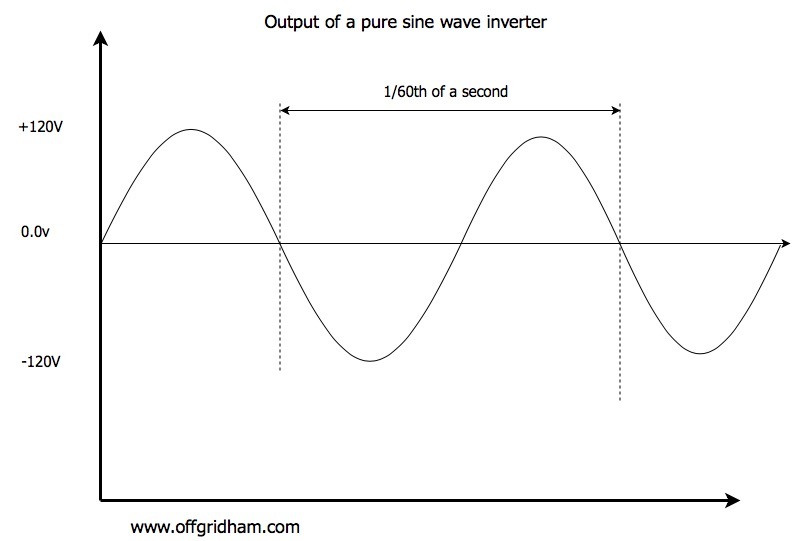 Pure sine wave inverters are generally more expensive but produce correct AC power. Most RFI problems associated with inverters are due to grounding issues. Never use square wave or modified sine wave AC inverters to power critical medical equipment without explicit approval from manufacturer tech support or vendor. These older Off Grid Ham articles discuss the technical details of AC inverters and how to wire/install them: Part 1 and Part 2. Samlex inverters –manufacturer homepage (USA). Thanks for the article Chris. The experiences I and people I know in ARES confirms everything you said here. The cheap inverters they sell in the hardware or automotive sections of department stores and places like Harbor Freight are not worth the plastic they’re packaged in. You might be able to run a small one or two cup coffee maker off one, but that’s about it. I’ve even seen those things literally start smoking and melt down under a load they should have been able to handle. I’ve never seen an Exceltech unit, but one of the ARES people used a Samlex to power some of his equipment and it works very well for him. It provided a pure sinewave and was virtually RF free, never over heated or caused any problems at all. But wow, some of those are expensive! I looked up Exceltech’s equipment and almost fell off my chair when I saw the prices. But if you need to get 120 VAC out of DC electrical system, I can confirm that the Samlex works very well. Thanks, Chris. A great write-up, as usual.